This game is a take on the classic 80's shoot-em-up arcade game, Galaxian. It really doesn't have an ending, just like Galaxian it gets harder as you increase levels. If you get shot you lose a bit of vitality. Each level begins with a wave of smaller ships and ends with a boss ship. Beat the boss ship and your ship regains a little vitality. This game is very fun to play, because it takes a few games before you learn how to get high scores. Once you learn, you can play against you high score. To start the game click inside the applet and press the space bar. 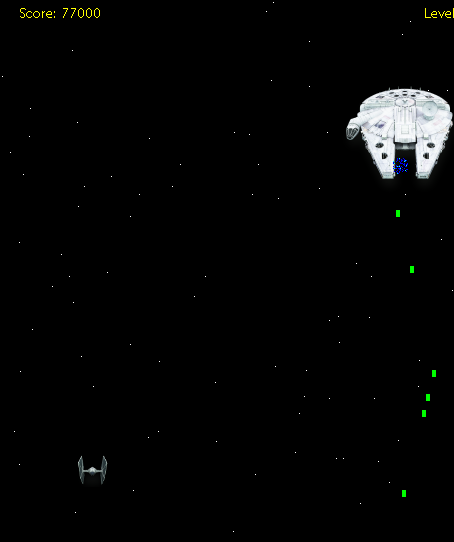 The ship moves with the arrow keys. The space bar fires your basic weapon. The L and K keys fire the lightning lightning attack. Every once in a while a power-up drops down from the top of the screen. For every one and you grab you will be able to fire the lightning attack once.